Everyone agrees that the Affordable Care Act improved the situation for those people subject to the the Medicare “donut hole” in the Part D program, those people who have pre-existing conditions that prevented their ability to purchase health insurance, and the poor. Unfortunately these changes improved the situation for a very small portion of the population. 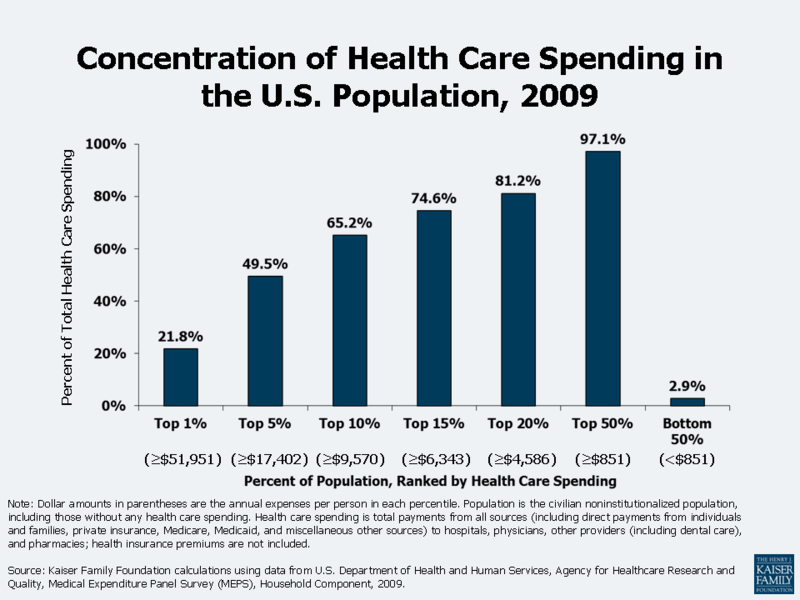 Here is the Kaiser slide about the Concentration of Health Care Spending. The Affordable Care Act tries to help out with the left side of this chart. Most of us are on the right side of the chart and we need affordable health care options. If we look at the NIHCM brief, Spending for Private Health Insurance in the United States, we cannot help but come to the conclusion that if high health care costs are the problem then group health insurance is the wrong answer. It wasn’t that way when I started working in 1976. Group health insurance was cheaper than individual health insurance. Here is my favorite quote from the brief. Premiums for coverage purchased in the non-group market are considerably lower than for coverage obtained through an employer and are rising at a slightly slower pace. If you are a small or medium sized business that partially subsidizes the employee health insurance cost, the individual insurance market is very attractive compared to the group health insurance approach. According to the NIHCM brief those companies looking at the group health insurance approach would be looking an a 2011 employer contribution of $11,060, an employee contribution of $3,962, and an employee deductible of $2,220. When you look at the individual market approach the premium cost of $4,968 and the deductible of $3,879. When you combine individual health insurance with a $6,000 HRA, a HRA is pretty attractive option for healthy through moderately unhealthy employees. For a healthy to moderately healthy employee you will pay nothing with the HRA approach versus $3,962 for the group approach. According to www.ehealthinsurance.com there are 44 states who have an individual health market close enough to the national average that makes the individual health insurance an attractive option. A small business in these states who has less than 50 employees can get the holy grail of health care benefits, a defined contribution benefit that pays for essential benefits for their current and prospective employees. Unfortunately the same situation is not available for those businesses in Connecticut, Washington, Alaska, New Hampshire, New York, New Jersey, and Massachusetts. Their health care costs are already too high to make HRAs a viable option.